I’ll cut the long story short. I like Patisserie G and I foresee myself revisiting this place and eating the same stuff over and over again…. definitely up in the ranks of k ki, and ET artisan sweets for me. Love the calm, wooden interior of the place decorated with Atomi sourced furniture. It’s very small with only a couple of counter seats and three tables- definitely not for big rowdy gatherings. For $3 a piece these macarons are really expensive (ET’s are slightly bigger and $2.50 a piece). I’ll still pay for them though because these are good macarons. 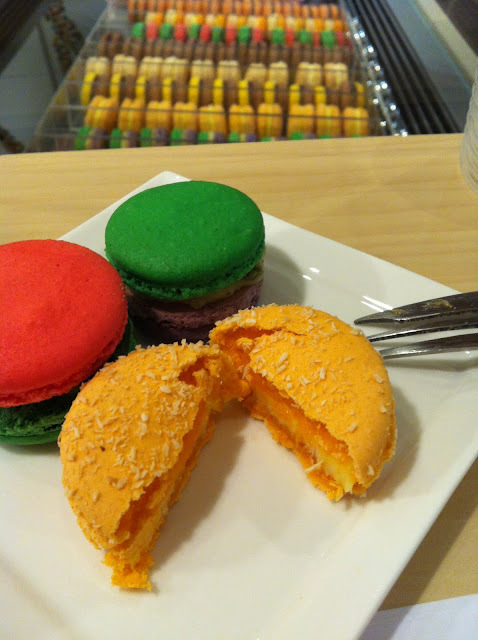 The macarons are very similar to PH- not surprising since the owner did a stint at PH. Hardly chewy, obviously aged for a bit but the ratio of buttercream is not as disproportionate as PH’s 2:3:2 ratio aha. ET’s macaron shells are in contrast firmer, and denser (or chewier. I hesitate to use this description sometimes cuz it has connotations of stickiness which is NOT the case). 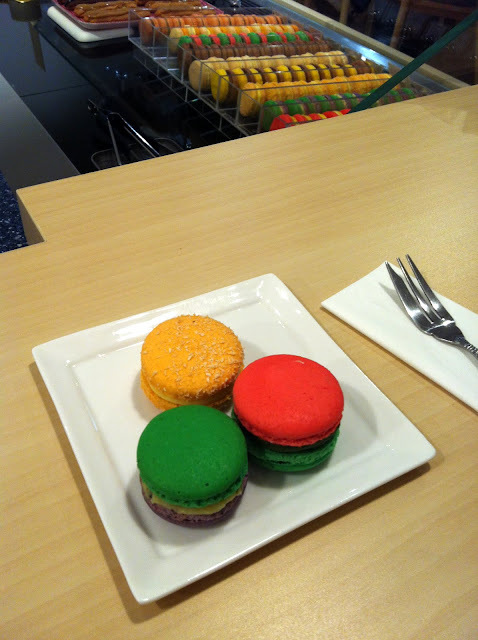 Being a fan of PH it’s not surprising that I enjoyed these macarons too. The adventurous flavours are a major plus point though I won’t mind them being a little stronger. Passionfruit-coconut, cherry-green tea (alcoholic, but it’s not v strong as compared to ET’s blackforest), and olive. Definitely not your usual chocolate or vanilla macaron. I like that she’s testing more unusual combinations and going with savoury flavours that work well with sweets. Combinations are a little ‘safe’ but I’m definitely not complaining about the variety that she’s injecting into the ‘industry’. 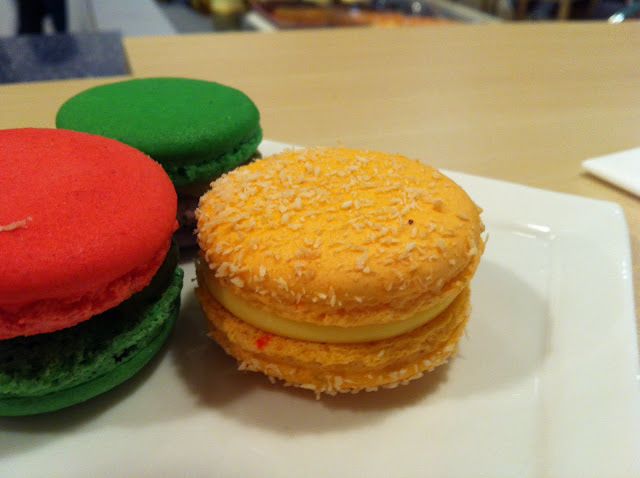 Macarons should be fun and packed with layers of flavour! 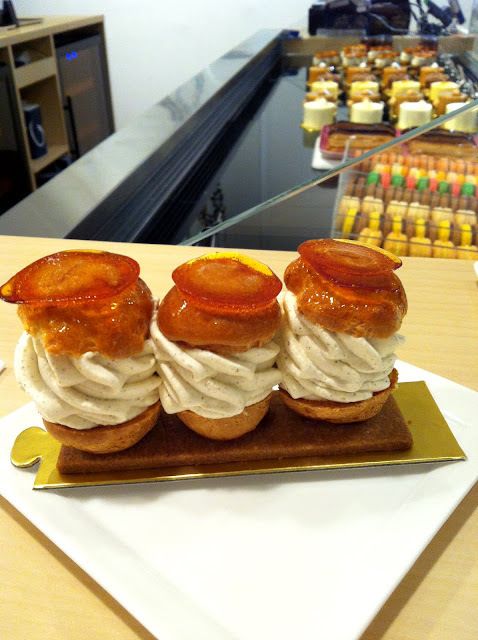 Her presentation of St. Honoré ($8) is a little unorthodox but I do agree this is a much neater way of eating it. Every bite tasted like vanilla cloud with different crunchy textures haha. That caramel on top was spot on perfect. In terms of flavour, smokey and not too sweet, cooked perfectly! Texture-wise thin enough to provide a crunch without having to break a molar. Her other entremets looked larger than k ki’s. Combinations sound good especially her twist on the tiramisu. Can’t wait to try her other creations on my next visit!